It’s a more relaxed affair this time around with most of the games being about balance and leaning rather than frantic arm swinging. If any players have been glued to Wii Fit they might just have an edge here. All the events work with just the wiimote, with the nunchuk an optional extra for more precise control or to feel more realistic for events such as skiing. And it’s the skiing that makes up the main meat of the game, whether it is downhill slalom, freestyle or ski jumps. They control well and are the disciplines that are the most accessible to a wide range of players. 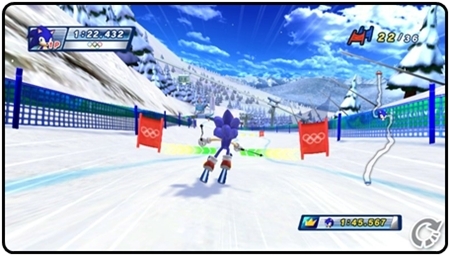 In a smart move, Sega have allowed the Wii Fit balance board to be used in some events, just in a separate single player ones though and not in the main game. The best use of this is for the Bobsleigh or Skeleton events where you can sit on it and lean around corners. Kids will love it and reclaim the Wii from their Wii Fit loving mums. The only thing missing is the chance to hop onto the board after the initial sprint; this is replaced by a button press. So you might as well start sitting on it. You can’t help but feel Sega missed a bit of a trick here, but safety might have been a concern. You could always put a few extra moves in just for fun, such as lying on the board for the Skeleton events (probably works better if you’re a small child). 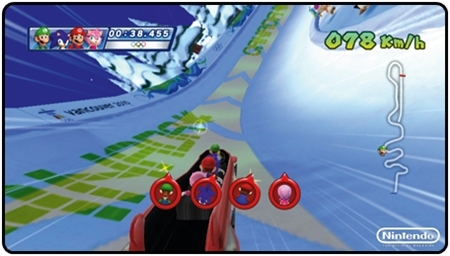 Multiplayer Bobsleigh is fun though with the wiimotes, as you all have to line up and lean at the same time. There are some separate party games such as Balloon Attack, where you shoot various targets to beat the other three players. You are only given so many shots though, once you run out, your target icon turns into a shield so you can attempt to block the other player’s progress. The small amount of shots you are allowed is decided by a quick event from the main game, which takes longer than the shooting part itself. It would have been better to just have the balloon shooting on its own as you play the rest of the events in other parts of the game anyway. Some of the events just feel too awkward to control to bother trying to drum up any enthusiasm for, especially as a group or for younger players. 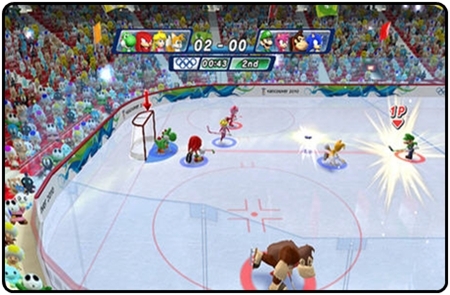 The ice hockey controls feel counter-intuitive, with the shooting having a mind of its own. The Speed Skating events are poorly controlled too. Instead of holding the wiimote and nunchuk in each hand and mimicking the swaying hands of the skater you only hold the remote vertically and move it in a straight line across your chest, desperately trying to find the rhythm in the cornering. Other events include snowboarding (similar to skiing), figure skating and that adrenaline pumping, ice brushing curling. Apart from the Mario and Sonic universe themed characters the events are pretty ‘realistic’ with no power ups. That’s where the Dream events come in, adding lots of Mario Kart style pick-ups or point icons to beat your opponents and add a welcome dose of fun into things and even the playing field a little too. A lot of the events feel quite similar and generally involve leaning rather than frantic arm-pumping. 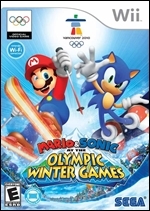 So overall it does feel like a slightly less varied package than the standard Olympics, but hey that’s the Winter Games themselves for you. You can almost guarantee you’ll have more fun playing this than watching the sport itself next year. to be on thee lookout for!! !